Coal mines and thermal power plants have used Rulmeca Motorized Pulley conveyor belt drives for more than 60 years. From Kazakhstan to the US to Thailand, on every continent, mine and plant operators have learned that Motorized Pulley technology is reliable, safe, and easy to install. The Westmoreland Kemmerer, Inc. coal mine in Kemmerer, Wyoming is a 13,400 acre opencast mine complex which currently produces coal in three active areas from 12 primary seams and splits. It opened in 1881 as the Twin Creek underground mine to work the Adaville Formation and opened the Elkol Underground Mine in 1950. The Sorensen opencast operations opened in 1963. 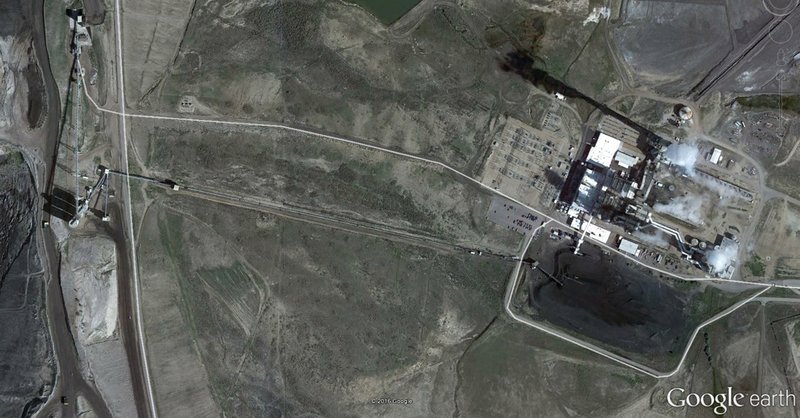 The Kemmerer Mine has an annual production capacity of 4.8 MTPY of 9,800 Btu sub-bituminous coal. The mine supplies approximately 2.8 MTPY of coal to a 700 megawatt thermal power plant, adjacent to the mine, via a 4,200 ft long overland conveyor (Figure 1). Commissioned in 1963, that plant feeds a grid which serves customers in Utah, Wyoming, and Idaho. Figure 1: Westmoreland Kemmerer Mine (left) and thermal power plant (right) are connected by 4,200 ft long overland conveyor, which moves 2.8 MTPY of sub-bituminous coal. The Kemmerer Mine also operates a loading facility 3 miles south of the overland conveyor transfer station which supplies coal to other customers, including several trona mines and a sugar refinery approximately 60 miles east of the mine near Green River, Wyoming, via truck and rail. Note that Rulmeca Motorized Pulleys have yielded satisfactory performance at these trona mines for more than seven years. 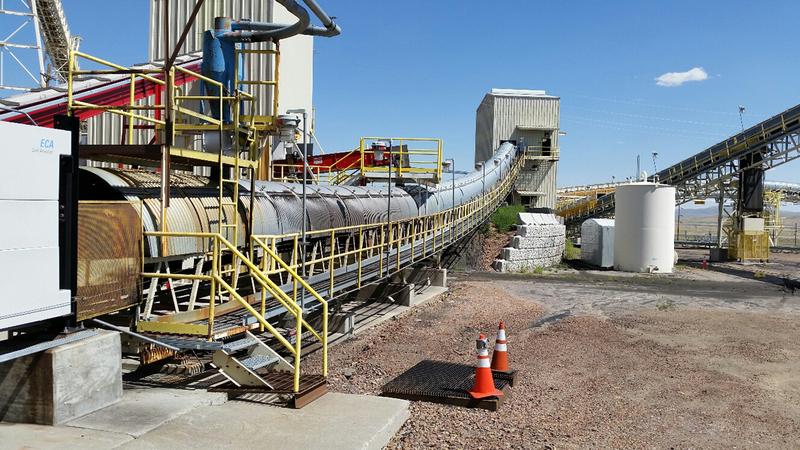 Faced with an aging silo reclaim conveyor and 20 years of coal in reserve, the mine decided to improve plant efficiency and plan for the future, by upgrading a problematic drive system on the 450 ft long 54 in wide inclined #130 conveyor in 2015. Fed by three weigh belt feeders beneath three silos at a rate of 1,600 tph, this convex conveyor feeds the overland conveyor as well as a truck loader (Figure 2). Figure 2: Silo reclaim conveyor #130 transfers coal from three silos to an overland conveyor or a truck loader on a 54 in wide belt at 600 fpm. In 2015, the mine’s #130 conveyor drive consisted of a 200 HP totally-enclosed fan-cooled (TEFC) AC squirrel-cage induction motor coupled to a pedestal-mounted right angle gear reducer, which was coupled to a live-shaft, lagged drive pulley with external pillow block bearings and mechanical backstop. Eventually, the exposed drive system became unreliable due to chronic coupling failures (requiring weekly re-welding) and occasional pulley slippage. Slippage was most prevalent during winter weather temperature, which can approach -30°F. Unscheduled outages due to conveyor drive problems caused difficulties for operations personnel because the mine is expected to deliver coal to the power plant for 20 hours each day and 5.5 days each week. In addition to improving conveyor reliability and performance, mine management has a strong desire to improve working conditions for plant personnel while reducing the cost of maintenance as much as possible. 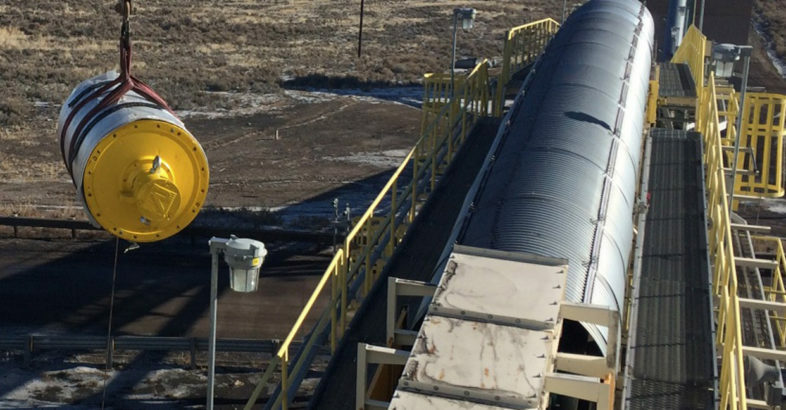 Conveyors & Equipment of Salt Lake City, UT suggested that Kemmerer Mine consider a Rulmeca Motorized Pulley to replace the aging #130 conveyor drive in 2015. By December of that year, one 180 HP model 800HD Rulmeca Motorized Pulley was installed in the conveyor head position (Figure 3). 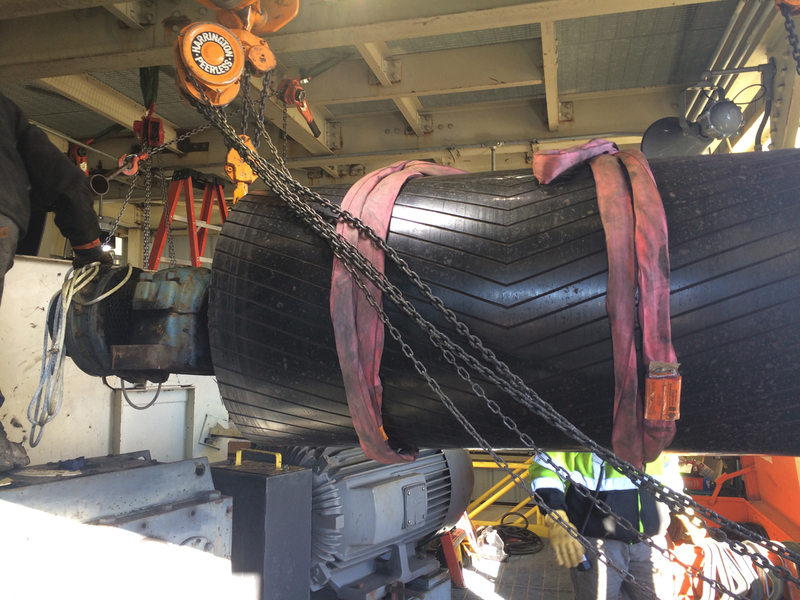 The installation crew only required one shift to install the 5,700 lb Motorized Pulley thanks to the pulleys’ compact size, light weight, and ease of alignment. Time-consuming drive component alignment was unnecessary because all drive components are internal and pre-aligned (Figure 4). 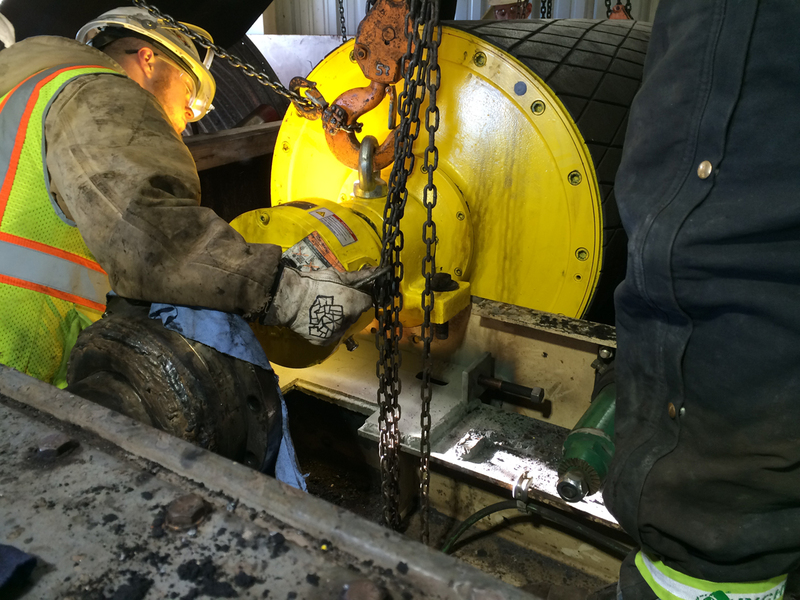 Figure 3: Rulmeca model 180HD Motorized Pulley was installed at Westmoreland Coal Mine on a cold day in December 2015. Thermal power plant is shown in background. Figure 4: Model 800HD Rulmeca Motorized Pulley at 180 HP with face width of 61.02”, belt speed of 600 fpm, and full ceramic lagging was installed in one shift. Motorized Pulleys, in general, increase system reliability, lower maintenance expense, improve personnel safety, save space, and reduce power consumption because they enclose all drive components within an oil-filled and hermetically sealed pulley shell (Figure 5). Figure 5: Motorized Pulley hermetically seals motor and gearbox within oil-filled pulley shell. The weight of the original drive system at the Kemmerer Mine was nearly 50% more than the Motorized Pulley drive (Figure 6) because each Motorized Pulley encloses its motor and gearbox within the pulley shell, eliminating redundant parts. 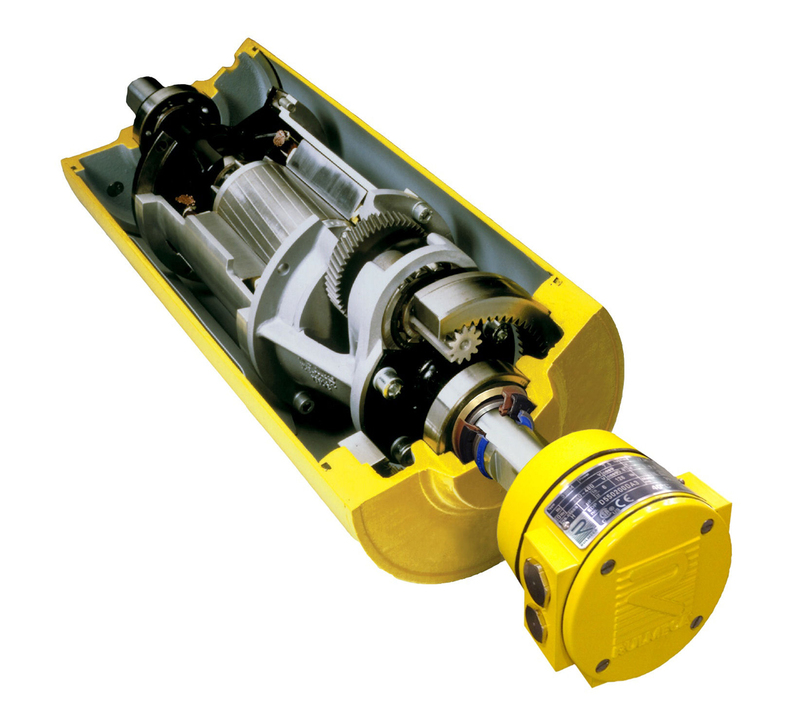 Motorized Pulleys are lighter because exposed systems require motors and gearboxes to be protected within separate cast iron or steel enclosures. Furthermore, the internal drivetrain acts like a deep beam, resisting deflection in a light weight package. Figure 6: Live shaft pulley and two pillow blocks (above) and exposed motor and gearbox (below) during removal from service. Weight of original drive system was nearly 50% more than Motorized Pulley drive. 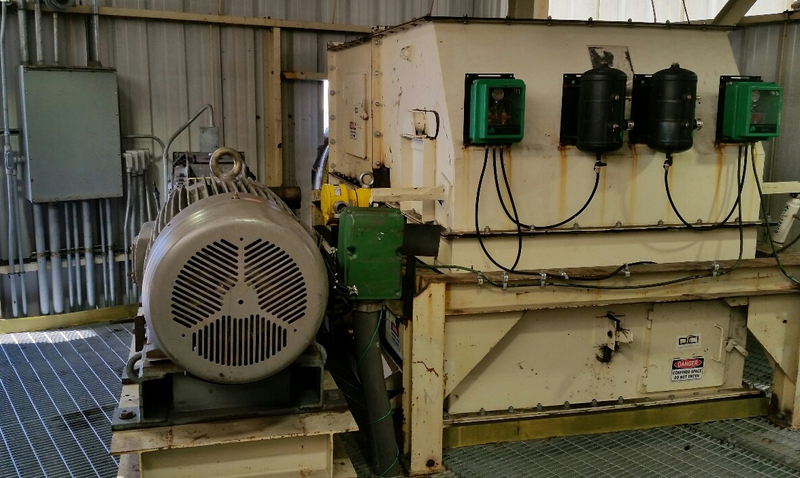 Nearly one year of satisfactory performance by the Motorized Pulley on the #130 conveyor convinced Kemmerer Mine personnel to consider switching other conveyor drives from exposed drives to Motorized Pulleys as budget and schedule permit. Conveyor upgrades in the train and truck loadout facility are currently under review. The Kemmerer Mine left the original exposed motor and gearbox in place to serve as back up to the Motorized Pulley drive system (Figure 7). Note that personnel access to the #130 conveyor drive will be improved when the drive system is eventually removed. Figure 7: Original exposed drive motor and gearbox are still in place, serving as a back-up to the Motorized Pulley. When these items are removed, personnel access to the drive pulley will be enhanced. Although sound level testing was not performed at the Kemmerer Mine, sound meter testing at a European coal mine revealed a 15 decibel reduction in noise after a comparable 100 HP Motorized Pulley replaced an exposed drive system. That same mine measured a 7.8% efficiency improvement for one 100 HP Motorized Pulley, yielding an electrical power savings of $5,900/yr, calculated as follows: $0.115/kw-hr x 5.86 kw-hrs x 8,760 hrs/yr = $5,900/yr. 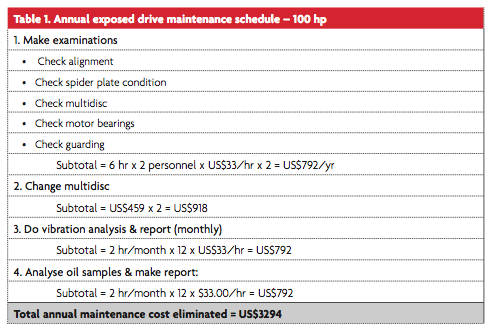 The European coal mine also eliminated numerous maintenance tasks and nearly $3,500/year when they replaced their old exposed drive system with a new 100 HP Motorized Pulley, as shown in the following table. 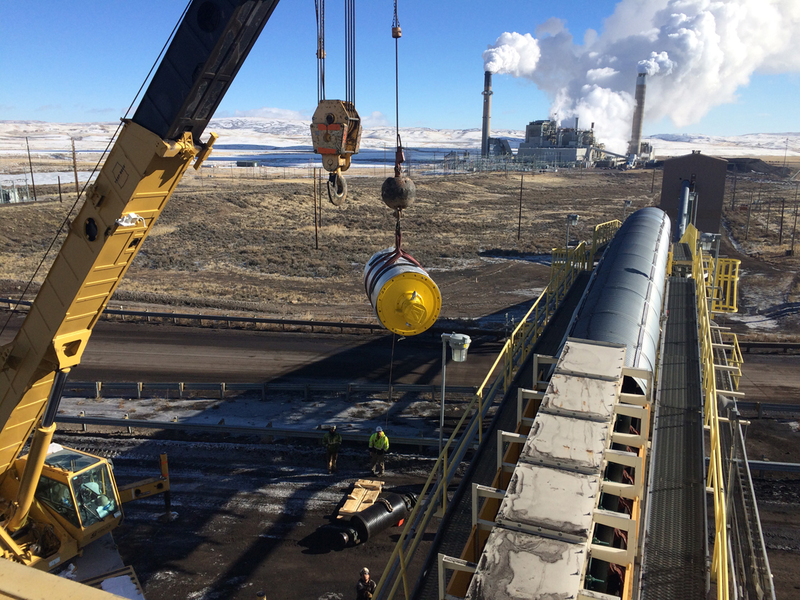 The Kemmerer Mine’s adoption of Motorized Pulley technology is part of a local trend, which began in the trona mines in southwestern Wyoming several years ago in both surface and underground conveyors. The acceptance of Motorized Pulley technology throughout the US, across Europe, and in Asia began slowly in the 1980s but has accelerated in this century. Gawinski, M. J., “Protective Pulleys”, Bulk Materials Handling Review: A Supplement to World Cement (2011), pp. 49-53. Gawinski, M.J., “Dual Personality”, World Coal (January, 2013), pp. 65-70. Steve Pringle, Mike Gawinski, “Motorized Pulley Usage in USA and UK Coal Mining Industry – Next Step Will Be Underground Deep Mines”, Bulk Solids Europe Conference, Berlin, Germany, 2012.